Spinach needs no introduction – it is an officially acknowledged super food: rich in protein, fiber, plenty of vitamins, iron and calcium. When the season comes we cook it non-stop and we are always on a hunt for new spinach recipes, that can add a special twist to already familiar ingredient! This vegetable tastes fantastic in pies in quiches, can be added to pastas and soups, or even be a delicious starter on its own. Our today’s special sesame recipe is inspired by Asian cuisine, but it features ingredients from all over the world: sesame seeds, white poppy seeds and even balsamic vinegar. It presents a unique combination of strong flavours, that can be achieved without any unnecessary additives to the dish. It also combines qualities of comfort food and an “addictive” crunchy note, that go so well together, that it is impossible to stop eating it! Peel garlic and shop it into small chunks. Don’t chop it to small, it shouldn’t burn or disappear on the pan. Heat the oil and add garlic. Fry for about one minute, be careful, the garlic shouldn’t burn. Add entire spinach to the pan and cook for about 5 minutes. Stir occasionally and make sure that it doesn’t overcook. If spinach is cooked for too long it looses its taste and a pleasant texture. When spinach is ready, transfer it to a plate and mix with 1 tsp of balsamic vinegar. If you prefer, you can also use a regular vinegar. Roast the seeds: heat the pan over medium pan and roast sesame and poppy seeds. Stir continuously, so that the seeds do not burn. In this recipe we are using white poppy seeds, that is also called Asian poppy seeds. If it is difficult to fin you can also opt for black poppy seeds, but it will look and taste different. Add seeds on the top of the spinach. 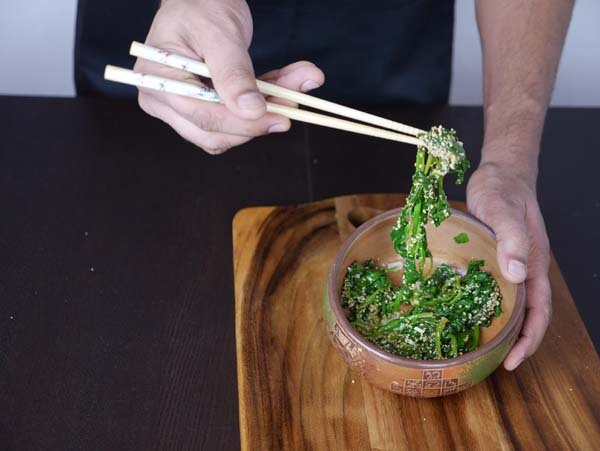 Your delicious and easy sesame spinach is ready!